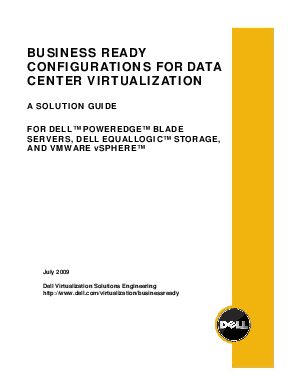 The Business Ready Configurations for Dell PowerEdge blade servers, Dell EqualLogic SAN, and VMware Infrastructure provides a detailed reference architecture for deploying and using VMware virtualization on Dell blades and iSCSI storage environments. The Dell PowerEdge M1000e supports the recently announced 11th generation Dell PowerEdge M610 and M710 blade servers based on the new Intel Xeon processors. The intended audience for this white paper is IT administrators, IT managers, and channel partners who are planning to deploy VMware virtualization using Dell blade servers and Dell EqualLogic SAN. This white paper provides an overview of the recommended servers, storage, software, and services. It can be used to plan, scope, and procure the required components to set up a virtualization infrastructure.